This is a 33 metres (108 ft) high water tower in the small Danish town of Sakskøbing. 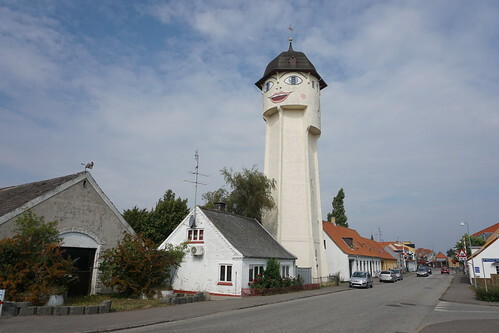 It was built in 1908 and later in 1982 on suggestion of architect Fleming Skude, the face was painted - with two windows of the tower as eyes and the roof as a hat. Though the water tower is no longer in use but it has been preserved and is now a very well known landmark in the town and is lovingly called Saxine.